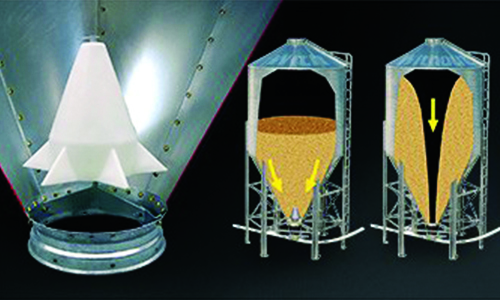 Cumberland feed tanks feature the exclusive, patented “Auto-Lok” ground control access system for opening, closing and latching the fill cap safely and easily from the ground. Cumberland’s bin lid features a durable LLDPE construction and is factory assembled for easy installation. The lid swings open a full 180 degrees, lying flat and parallel to the ground, but positioned below the peak ring when fully opened. A reinforced rubber bumper provides additional protection to the peak. 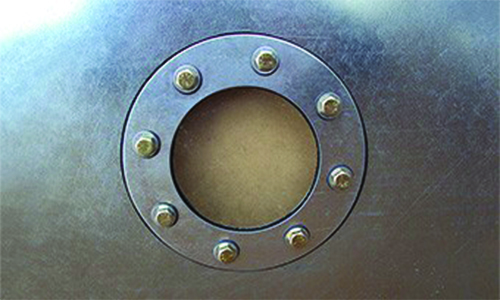 An internal magnet helps keep the lid closed. High strength ladders with roll-formed sides are available in 2’ and 9’ sections for quick assembly. Ladder rungs are engineered to eliminate rung spin, and are dimpled for better grip. 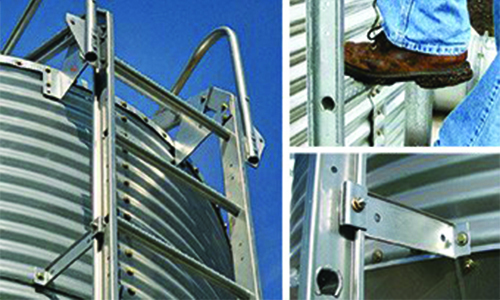 Galvanized ladder cages are available for all Bulk Feed Tank sizes. Cumberland offers your choice of a 30 degree or 40 degree bin roof to adapt to any application. Roof panels are precision manufactured Reinforcing Ribs using die-form tooling to provide consistent quality. Both 30 degree and 40 degree roofs feature reinforcing ribs at each roof seam for added strength and rigidity. Cumberland’s drip lip water deflection design is a one-of-a-kind, roll-formed bottom sheet edge. It forces water away from the hopper and lower boot area, giving complete weather protection without a loss in capacity. The optional Sure-Flo directs feed down the hopper of the bin rather than down the center, creating a first in, first out flow. 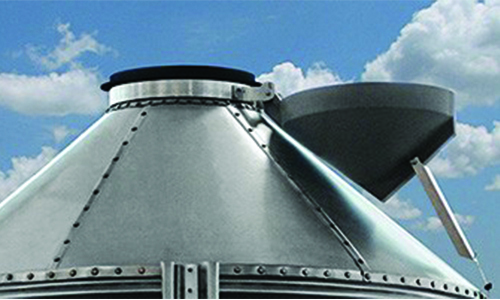 Optional view windows, Hopper or Sidewall, allow you to easily check the level of feed in the bin. Another Cumberland exclusive is the pre-punched, extruded lip roof panel provided for the optional pneumatic fill kit. Pre-punching eliminates the inconvenience and difficulty of Extruded lip roof panel field-cutting the openings for the fill and exhaust tubes, and insures secure, moisture-proof seals.